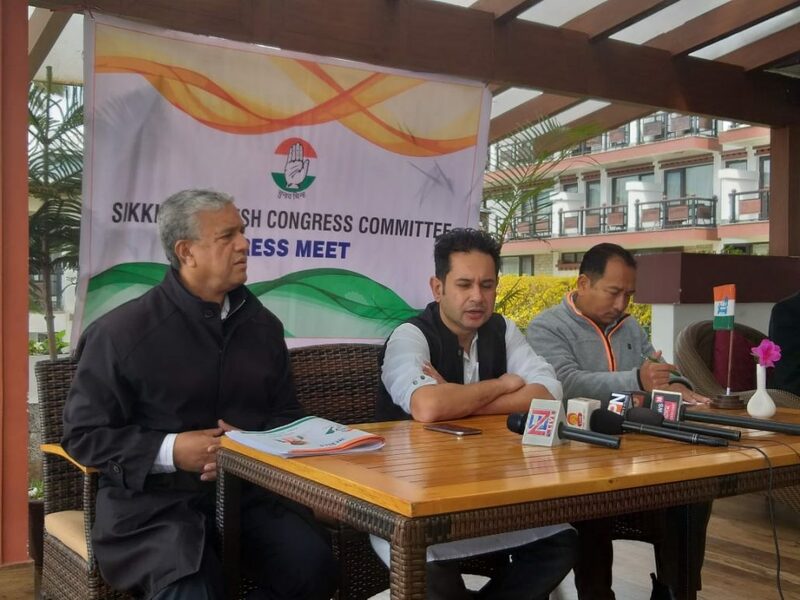 Sikkim Pradesh Congress Committee (SPCC) has decided to submit a memorandum to the Governor of Sikkim on the allegations made by the Chief Minister of political murders and other acts by SKM president in his address during the recently held Rojgar Mela at Gangtok. In a press conference in Gangtok on Friday, All India Congress Committee secretary in-charge for Sikkim, Pradyot Deb Barman stated that the chief minister has made serious allegations on SKM president but it was really surprising he did not take any action till date despite of also being the minister-in-charge for Home Department. “If the chief minister has all information about deeds of SKM president then he should take action. The politics of allegation is not healthy and not to make such serious allegations without having any proof,” he said. He stated that no action from the government also indicates that it could be propaganda. Barman stated that the Congress party would request the government to use his special powers to find out the truth behind these allegations. He asserted that allegations of the chief minister were very serious and there should be a serious investigation upon the same. Responding to media queries, he stated that the alliance of the Congress party would be based on ideology, programmes and in the interest of Sikkim and its people and not on monetary agreement. He stated that AICC was very serious on the upcoming election. “We will go to the people of Sikkim with local pertaining issues of the State. We are soon opening our offices at all districts to reach out the people in the grassroots level,” he said. He mentioned that the issues of the Congress party for Sikkim were the safeguard of the Article 371F, employment to local youths and others. On the Citizenship (Amendment) Bill, Barman stated that it was really surprising that the SDF MP has supported the bill at Lok Sabha when intense protest was going in the region against the bill. He stated that if the bill will be implemented in the State then it would be threat to small population of Sikkim. He added that such bill was totally against Sikkim and its people.